When you see a rare and interesting car at a classic or vintage motoring event it is a pleasure – but it’s a particular delight when you see one “out of captivity” in a car park, largely unrecognised by the people surrounding it. This Snapshot was taken early this summer at a famous British Grade 1 Listed garden; clearly, its owner had decided to take advantage of the wonderful weather. It is a rare car: only 99 Gordon-Keebles were produced between 1964 and 1967, with a final one later made up from spares, to bring the total to 100. The car in our Snapshot is in fact number 100. The Club website tells us that it was completed in 1971, 4 years after the end of normal production – and the J registration in our original image confirms this. John Gordon formerly ran the Peerless company, building about 325 of these fibreglass-bodied 4-seaters, with TR3 running gear in a tubular space frame, between 1957 and the failure of the company in 1960. Gordon joined with Jim Keeble in 1959 to make the Gordon GT, by fitting a Chevrolet Corvette V8 engine into a Peerless chassis for a USAF pilot. The car was impressive enough for them to decide to manufacture a more advanced machine, with a tailor-made square-tube spaceframe chassis, independent front suspension and 4-wheel disc brakes. It was fitted with a 4.6-litre Chevrolet V8, and sent to Turin for Bertone to clad the chassis in a steel body designed by the great Giorgetto Giugiaro. The design’s distinctive slanted twin headlamps were somewhat fashionable at the time – being seen on the 1961 Lagonda Rapide, the Lancia Flaminia and later, in 1963, on the ‘Chinese Eye’ Bentley Continental S3. What we cannot see in this Snapshot is the interior: often likened to the interior of a luxury jet aircraft cockpit, it featured white on black gauges and quilted PVC seats. The car was first seen on the Bertone stand at the 1960 Geneva show, branded simply as a Gordon. A serious challenge, however, remained: gaining a reliable source of engines. So the car was shipped to Detroit to be shown to Chevrolet management, who were impressed enough to agree the supply of Corvette engines and gearboxes for production. Two main changes were made between prototype and production: a larger Chevrolet V8 of 5.4 litres and 300bhp, and bodywork in fibreglass rather than steel. Then followed the downfall of many a small sports car manufacturer: problems with obtaining parts from many suppliers at a cost that would allow a competitive selling price. Very soon after production started, the money started to run out and Gordon-Keeble went into liquidation. The cars have a remarkable survival rate. 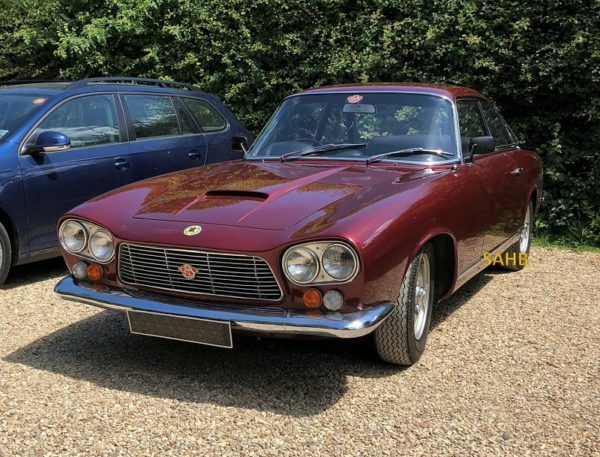 According to the Gordon-Keeble Owners’ Club, over 90 Gordon-Keebles still exist – a testimony to the quality of this beautiful and rapid machine. We cannot end this story without explaining the origin of the car’s mascot – a tortoise. At the inaugural photo-shoot in the grounds of Gordon-Keeble a pet tortoise walked into shot. Struck with the irony of such a slow animal sitting alongside such a speedy car, the makers chose this as the emblem that appears on the bonnet of every one of their cars.